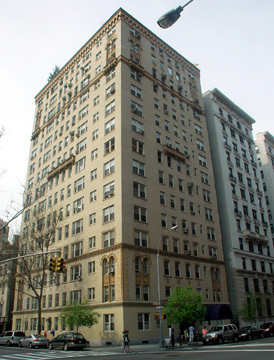 This handsome, 15-story, cooperative apartment building was erected in 1927. It has 65 units. It was designed by Gronenberg & Leuchtag. According to the historical district designation report, "sources indicate that it was constructed on the site of the Arbutus, a brick-faced aprtment-hotel of seven stories with a basement." The yellow-brick building has a canopied entrance, a doorman, a one-story limestone base, attractive rope quoins on the second and third floors, a handsome, scalloped cornice, nice decorative balconies, sidewalk landscaping, protruding air-conditioners and arched windows on the second floor from the top. It is across the sidestreet from the low-rise Greek Orthodox Church of America, which provides it with considerable "light and air." The building has no health club, no roof deck and no garage. It has an interior court that opens to the north. The entrance is flanked by two metal and yellow glass lanterns and set into an arched enframement with Norman style moldings, small capitals, archivolts and carved panels. The second and third stories are capped by a cornice and framed by terracotta quoins with a decorative engaged colonnette at each corner with Norman style ormanent. The center bays of the 14th floor are arched and have ornate terracotta typanums and the building is capped by a parapet with an arched cobel table and a narrow cornice. There is a one-story penthouse with a pitched red tile roof. 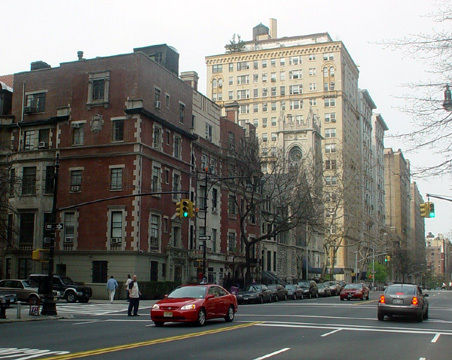 One of the city's best private schools, Trinity School, is a few blocks to the east on 91st Street and there are many restaurants and stores nearby on Broadway. This lively neighborhood is one of the city's finest architecturally. There is good bus service on Riverside Drive and Broadway and the nearest cross-town bus service and subway stations are not too far away at 86th and 96th Streets. The building has no garage, no roofdeck, and no fitness center and it permits protruding air-conditioners.